First impressions count even more online, so landing page optimisation is often a good starting point for conversion rate optimisation. THREE. Provide sufficient DETAIL to support the response decision. For us, one of the most important aspect of landing pages, and one that is often not right, is that there isn't enough detailed information on which the visitor can decide to signup. To help determine the right-level of information, best practice is to use design personas to identify typical information required and the gap relative to what you deliver. FOUR. Start the user on their journey. The design should make the next step clear and minimise the number of clicks required for response since every extra click required in response will generally reduce response by 10%. SIX. Use meaningful graphics. Graphics must be consistent with the campaign and generate empathy for the audience. Don't understimate the importance of quality graphics - stock graphics rarely work. SEVEN. Remove menu options? Another guideline that causes disagreement. Removing menu options will often increase conversion rate since less choice of where to click is offered, but for those who don't respond will give a poor experience and prevent them browsing other parts of the site. Often a compromise is best with a reduction in menu options to top-level options only. EIGHT. Consider using a "flowable" or liquid layout design. Also known as progressive enhancement, this maximises real estate at a given resolution - Amazon do this, Orange don't. TIMITI is a term coined by Jim Sterne, founder of the Emetrics Marketing Optimisation Summit. It stands for Try It! Measure It! Tweak It! i.e. online content effectiveness should be reviewed and improved continuously rather than as a periodic or ad-hoc process. Landing pages are often used for short-term campaigns. If so, you need to carefully manage when they and links to them from within the nav are expired. A landing page is an entrance page to a site where a visitor arrives on a site when they click on an ad or other form of link from a referring site or an offline prompt. It can be a home page, but more typically and desirably a landing page is a page with the messaging focused on an offer featured in an ad or another site. Seven Steps structure – no-nonsense, super-scannable advice making it easy to create a focused plan. Commercial-results focused – the main aim of each guide is to help you get better returns from your online marketing, anything that doesn't help towards that doesn't go in. Workbook and template based – Create an action plan through working through the entire guide or just work on one area at a time. Comprehensive – Dave Chaffey and the authoring team have years of experience in online marketing, we know that the details matter and that’s what we show. Example-based – we believe we learn best through examples, so we illustrate through lots of examples and screen captures. 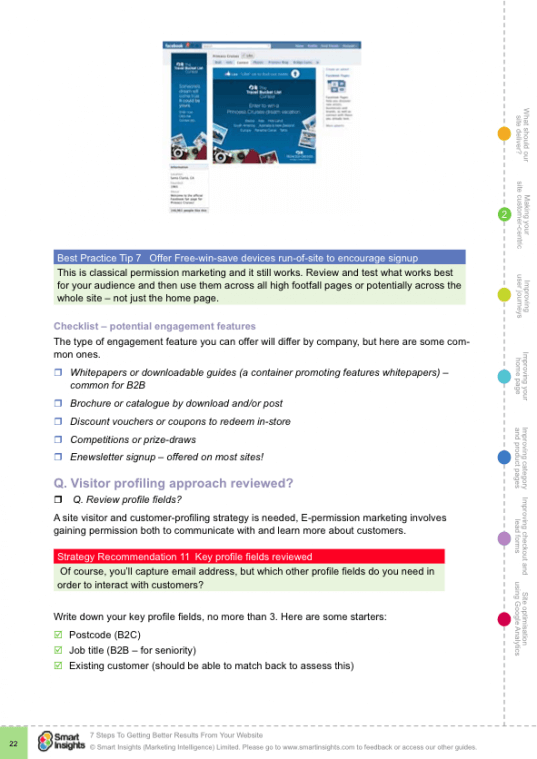 The guides are designed to highlight our recommendations and to help you review your approach using an easy to scan design for reading online or printing. How will the guides help me? Company owners and marketing managers - we help you create a plan so you can invest in the approaches that matter. We help you set goals and put in place a system to measure and improve since all our guides cover how to get more from Google Analytics. 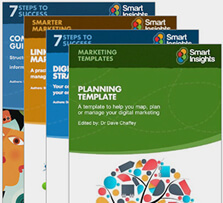 Digital marketing and Ecommerce managers - we help you get more from each of the key digital marketing channels plus your web and social presences through reviewing your approach using using our comprehensive workbook templates. Digital marketing specialists - whether you work on Social media marketing, SEO, PPC, email marketing or conversion rate optimisation for the website we have a guide to help you boost your approach. Consultants and agency specialists - review your techniques and process against the best practice checklists in our guides. The ones marked with an asterisk are specifically for landing page creation and optimisation, rather than a component of a larger system. To find out the details on the AB and multivariate testing they offer check out WhichMVT.